For British viewers, the tournament was being aired, for the first time, on Amazon Prime. The whole user experience was dreadful. At one point Amazon was so overwhelmed with complaints that the system crashed and reviews were suspended. For the first time, the US Open brought in a heat rule for the men by introducing a 10 minute break at the end of the third set. A quick dip in the ice bath seemed to help those players wiped out by the hot and humid conditions. At one point, Djokovic asked for a bucket to be brought onto the court – he seemed to be on the verge of throwing up. The Serb even called for a cardiologist during a medical time-out in the second set. The women were allowed a break after the second set. But this is where it got heated, so to speak. The French player Alize Cornet came back onto court having changed her top, only to realise she’d put it on back-to-front. She demurely faced the back netting, whipped it off and switched it round, revealing a far from skimpy sports bra, only to get a code violation for ‘unsportsmanlike conduct’. A public barrage ensued. How come the men can change their shirts during changeovers and women can’t? Are we really so prudish that we mustn’t see a sports bra? I mean for god’s sake, the women practise in them. Incidentally, one of the tabloids described hers as ‘red and black’ as though it were some kind of fashion show. The US Association subsequently issued the statement. ‘All players can change their shirts while sitting in the player chair. This is not considered a code violation’. I hope the women will feel able to do so in the future, although one can just imagine the wolf-whistles and cameras zooming in, but at least they have the option. And then, the Krygios incident (his matches usually are filled with drama). Not for the first time, Krygios decided he just couldn’t be bothered. At a set and break down against Frenchman Pierre-Hugues Hubert, he didn’t even deign to lift his racket to return serve. At which point the umpire, Mohamed Lahyani, got down from his chair to give him a long pep talk – ‘I like you; I want to help you …’ Krygios then woke up and went on to win the match. Understandably, Hubert was furious at what could effectively be seen as coaching, certainly not in an umpire’s remit. It’s a tricky one – the crowd was booing, some leaving the stadium on seeing Krygios ‘tanking’. They hadn’t paid to see a player not bothering to try and Lahyani was clearly trying to rescue the situation, but he definitely overdid it. Rafael Nadal, the number one seed, had some exhaustingly long matches, including a nail-biting win against Dominic Thiem to go through to play Juan Martin del Potro in the semis. At this point he faded, hampered by his old knee injury, and had to retire, clearly devastated at having to do so. Roger Federer seemed to be cruising through the tournament until he came up against an inspired John Millman. Federer didn’t look well, dark rings under his eyes, irritable with crowd noise and pretty dire first serve percentages. He also constantly used the drop-shot at inappropriate times – players do that when they are either tight or tired, keen to end the point. He seemed to be both. He lost in four close sets. Afterwards, he said he could hardly breathe in the sweltering conditions. Novak Djokovic seemed to have found his form again and was a strong favourite. He had already followed up his Wimbledon title with a pretty comprehensive win against a rather fragile-looking Roger Federer in Cincinnati. After Novak’s slaughtering of Kei Nishikori in the other semi in straight sets, we had a rather unexpected final between del Potro and Djokovic; the man with the crunching forehand against the ultimate defender – a juicy prospect. In the event, it was a rather dull and predictable one-sided affair with Djokovic winning in straight sets 6-3, 7-6, 6-3. Novak’s defence was just too good and Delpo’s pulverising forehands were mostly retrieved with interest. Having been out of the running for so long, Djokovic has this year won both Wimbledon and the US Open and looks to be the likely winner at the Aussie Open in January. Serena Williams was the heavy favourite to win her home Slam. But the early news was less about her tennis than about her fashion choices. Remember that black catsuit at the French Open? The French Federation stated that she would not be permitted to play in that again. It caused outrage and cries of sexism, even racism. But being the fashion queen, she replied she wouldn’t wear the same thing twice anyway. But she played incredibly; back to her pre-motherhood best. 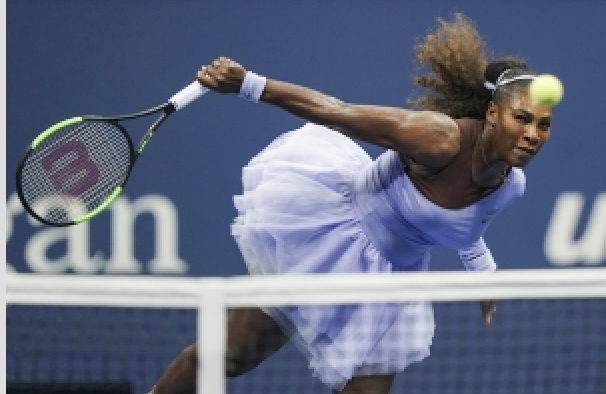 Her serve is beautiful, filled with fluidity, disguise and immense power. Her groundstrokes are also pretty ferocious. And as usual she screamed and fist-pumped when she won an important point. The holder, Sloane Stephens, another beautifully fluid player who glides round the court, cruised through to the quarters where, overcome by the heat, she lost in straight sets to an inspired Anastasija Sevastova. But the main story in the women’s was the Japanese player Naomi Osaka. She made her way to the finals having had a tough match against last year’s finalist, the American Madison Keys, in a battle of walloping ground strokes, with Osaka playing the more intelligent game. They say that tennis is chess played at 80 mph and this was a good illustration. So Osaka got to play her idol, Serena, in the final. One wondered if she would be overwhelmed by the occasion. The 20 year-old Japanese player won 6-2 6-4; on paper, a one-sided and uninteresting match. It was anything but that. Not for the first time at the US Open, Serena became embroiled in controversy and was docked points for screaming abuse at the umpire while her opponent stood by, open mouthed. First, a warning for receiving signals from her coach (which he later admitted to); second, a point penalty for smashing her racket and then a game penalty for screaming at the umpire and calling him “a liar and a thief”. The umpire was absolutely correct in his interpretation of the rules. The coaching rule, though, is harsh. The player shouldn’t really be penalised when they have done nothing wrong. It’s the coach who should be penalised. My take is that a coach should be ejected from the player’s box. That should be enough of a penalty to make them think twice about sending signals. It was extraordinary that Osaka held her nerve and served out the match, with over 20,000 spectators baying for blood. I reckon she would have lost if she’d been broken at that point and that would have been a travesty. As it was, Williams took away Osaka’s glory. The Japanese player should have been celebrating on the winner’s podium, not sobbing at being booed. During the fortnight, Williams accused both the French and US Federations of racism and sexism. She claimed an umpire wouldn’t have penalised a man for the language she used. It’s a nonsense. I’m pretty certain that a man would have been. You can’t call an umpire a liar and a thief in front of 20,000 people and expect to get away with it. Williams, as we all know, hates losing but her behaviour was outrageous. Good on the umpire for not being intimidated. What an extraordinary drama-filled fortnight.. Let’s hope the Australian Open in January is as exciting.